Newark, NJ! Home to the Jersey Cares office and the entertainment district! Newark now hosts the Prudential Center, the New Jersey Performing Arts Center, the Newark Symphony and the Riverfront Stadium! Newark sees many talented individuals on these stages. In addition to these super star performers, Newark is also home to almost 100 of our super star agencies! Last winter, Newark’s volunteers distributed around 8,000 coats and donated them to 39 agencies for the Jersey Cares Coat Drive. In addition, more than 800 children received holiday gifts through Frosty’s Friends, a winter gift-giving campaign. Volunteers painting Newark community center on Jersey Cares Day 2014! On the 16th Annual Jersey Cares Day, five non-profit partner agencies were revitalized by 350 volunteers! Volunteers painted classrooms, gymnasiums, murals and planted gardens and landscapes. In total, Newark’s volunteers served nearly 140 hours which benefited almost 1,000 children– outstanding results! The Jersey Cares Volunteer Opportunity Calendar partners with nine Newark non-profits to host more than 40 volunteer events monthly! Not only do individual volunteers prove to be stars while giving their time in Newark, but corporate volunteers also leave a tremendous impact! Last month, ADP dedicated their time to the city of Newark. 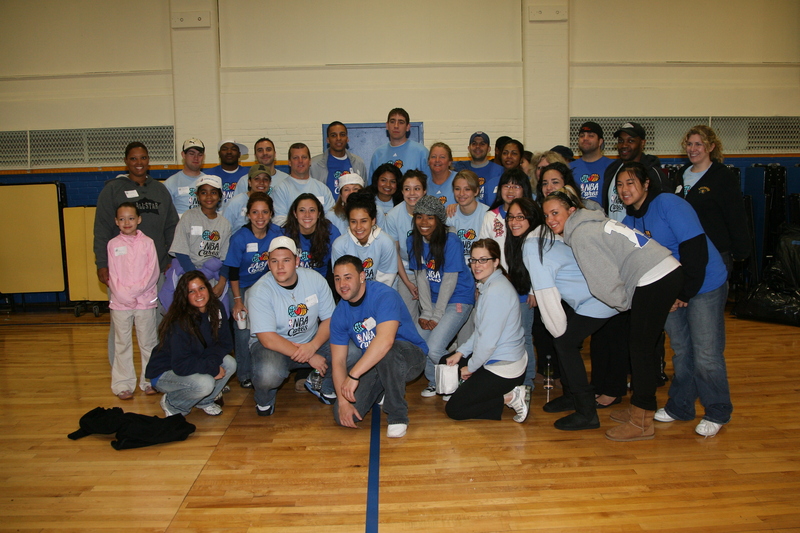 ADP volunteers contributed close to 300 hours of service with over 80 volunteers at two Newark schools. Newark certainly benefitted from their generosity! Jersey Cares continually posts fun and exciting volunteer opportunities in the city of Newark. Join us in continuing our efforts of volunteerism with Hunger Helpers, a monthly meal service volunteer opportunity, Plant it Forward, a community garden revitalization project, and Literacy Leaders, a weekly education initiative for children and youth. As Aristotle said, “What is the essence of life? To serve others and to do good.” Thank you to all of our volunteers who serve others! Jersey City is a great destination for the whole family. There are endless activities filled with educational value and fun! Jersey City hosts the Liberty Science Center, eight local farmers markets, the LeFrak Lighthouse, Newport Centre Mall, Liberty State Park and the breath-taking Hudson River Waterfront Walkway. The fun doesn’t stop there– Jersey Cares hosts many volunteer projects in New Jersey’s second largest city, Jersey City. Jersey Cares volunteers at Liberty State Park on The 16th Annual Jersey Cares Day. Jersey Cares volunteers continually contribute to the Jersey City community. In the last year, nearly 530 corporate volunteers served 14 different non-profits and over 300 volunteers served four agencies on The 16th Annual Jersey Cares Day. Volunteers have assembled 30 picnic tables and benches, over 15 line games, and almost 70 murals that are enjoyed by over 5,300 Jersey City children. Last winter, Jersey City was also warmed with the spirit of volunteers and 8 non-profits received more than 1,600 new and gently used coats through The Jersey Cares Coat Drive. Join us through the Volunteer Opportunity Calendar for three reoccurring events in Jersey City. Hunger Helpers, a weekly meal service volunteer opportunity, Earth Keepers, an environmental stewardship project, and Marketplace, a donation sorting opportunity in Jersey City this month. Jersey Cares hosts several reoccurring volunteer opportunities in Camden every month. Situated on the Delaware River with beautiful views of the Philadelphia skyline, Camden, NJ is home to several points of interest. Camden is the one time home of American poet Walt Whitman, Adventure Aquarium, The Battleship New Jersey Museum and Memorial, one of the largest and most decorated ships to have served in the U.S. Navy. Jersey Cares volunteers also enjoy visiting and giving back to the city of Camden. Jersey Cares partners with over 10 Camden non-profit agencies in efforts to meet their needs through our Volunteer Opportunity Calendar, Jersey Cares Day, and Jersey Cares Coat Drive. Throughout the year, volunteers consistently serve three Camden agencies with gardening assistance, meal service, and teaching local children how to eat properly. In May 2014, the 16th Annual Jersey Cares Day brought over 30 volunteers to help landscape a local garden. This past winter, Jersey Cares distributed almost 1,200 coats to four Camden agencies that were collected by three different local civic groups and businesses. Through the Jersey Cares Corporate Service program, over 120 volunteers will revitalize a Camden public school this spring. Join other Jersey Cares volunteers and contribute to the Camden community by joining us for Tree Treasurers, Set a Place, or Marketplace in Camden in the coming months.